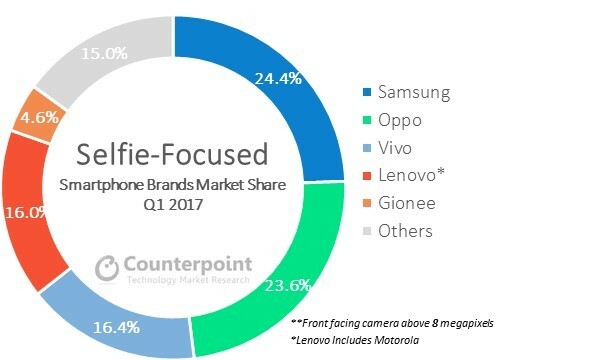 OPPO, vivo, Gionee registered highest annual growth driven by their selfie centric portfolio. According to the latest research from Counterpoint’s Market Monitor service, smartphone shipments in India grew a healthy 15% annually in Q1 2017, reaching 29 million units. The top five brands contributed to almost 70% of the total smartphone market. Xiaomi, for the first time, jumped to the number two spot while Samsung continued to retain the top spot. Vivo, OPPO and Lenovo (includes Motorola) made up the rest of the top five. 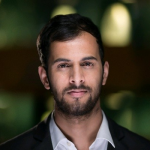 Commenting on the findings, Karn Chauhan, Research Analyst at Counterpoint Research said, “India’s smartphone market is witnessing a focus shift in distribution strategy by major brands. Offline brands like OPPO, vivo and Gionee have now started focusing on online channels as well to gain extra market share. Online only brands like Xiaomi and Motorola are moving fast into offline markets to widen their reach to the mass market, addressing consumers in tier-2 and tier-3 cities. While the Chinese smartphone brands are adopting multiple channel strategies to maximize growth, another Chinese brands iTel is disrupting the other half of the market (feature phones) by climbing to the number two overall mobile phone brand for the first time. iTel, also the number one mobile phone brand in Africa, is now leveraging its successful low-cost strategy, effective distribution and scale to grow in India market”. Overall mobile handsets and the smartphone segment witnessed healthy growth of 6% and 15% YoY respectively in Q1 2017. 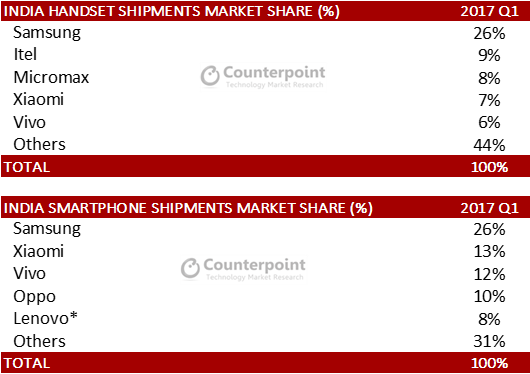 Smartphones and feature phones contributed equally to the overall mobile handset shipments in the quarter. LTE-capable smartphones contributed 96% of total smartphone shipments in Q1 2017. LTE is now a default feature for smartphones in India. Qualcomm-embedded smartphones grew a healthy 64% year on year and growing its share in smartphone market during Q1 2017. The increase in mid segment smartphone shipments drove this growth. Eight out of ten smartphones shipped supported a 5-inch or bigger display. Users are enjoying content on bigger screens, while cut-throat competition between telecom operators is resulting in low cost 4G tariff plans. Voice-over-LTE (VoLTE) capability in some networks is helping to drive a new device category called 4G feature phones (sometimes called ‘smart feature phones’). These are providing a way for current feature phone users to take advantage of low/no cost voice calls over the 4G LTE networks. Lava was the first to launch a 4G feature phone. Micromax, LYF, and other brands plan to launch 4G feature phone in the coming months. Indian brands are expanding to overseas markets for growth as they are losing their footing in the home market. Almost four out of five mobile phones shipped were made in India during Q1 2017. The imposition of the Goods and Services Tax (GST) will have an impact on domestic manufacturing and the government will need to continue incentives for locally manufactured mobile phones to further push the domestic manufacturing ecosystem. Mid end segment (₹15,000-₹20,000, US$230-US$310) witnessed the highest growth of 158% YoY during Q1 2017. Most of the growth was driven by Samsung, OPPO, vivo, Gionee, and Motorola. Premium segment (>₹30,000, US$465) grew a healthy 35% YoY. 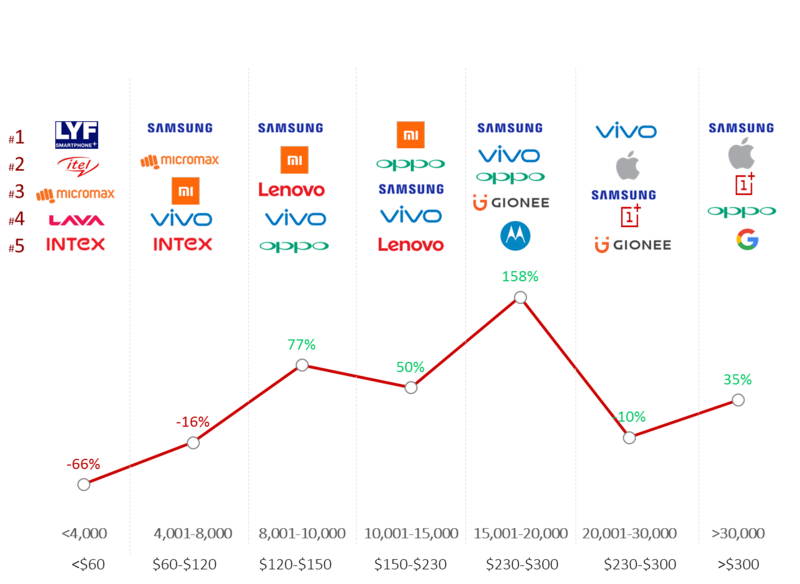 Samsung retained the top position with 48% market share, followed closely by Apple at 43% market share. OnePlus, OPPO and Google made it to the top five in this segment, but each with marginal shares. Integration of high-quality (8 Megapixel and above) selfie-focused camera in smartphones is one of the fastest growing trend though merely a supply side push to drive the selfie trend. Sales of devices focus on selfies trend grew annually by a factor of nine in Q1 2017. The segment was mainly driven by Samsung, OPPO, vivo, Lenovo and Gionee. The comprehensive and in-depth Q1 2017 Market Monitor is available for subscribing clients. Please feel free to contact us at [email protected] for further questions regarding our in-depth latest research, insights or press enquiries.